Sure, the rod–or rod case–length itself might seem inconvenient. But is there a performance bump? Pictured here: the Hardy Zenith one-piece. A long time friend who has spent many years as a saltwater backcountry guide recently questioned if I were still fishing mostly 2-piece rods? Either he was clairvoyant or had peeked at one of my recent outdoor columns accentuating this antiquated behavior. I love rods. Three of four corners in a downstairs jungle called the “tackle room” are laden with rods and tubes. Overflow reverts to a garage corner. A few members of this fiberglass, bamboo and graphite collection exceed my 70 years. Two-piecers abound because they’ve been around longer. I do enjoy several of the latest 10-ft. 4-piecers but that’s because they don’t come otherwise. 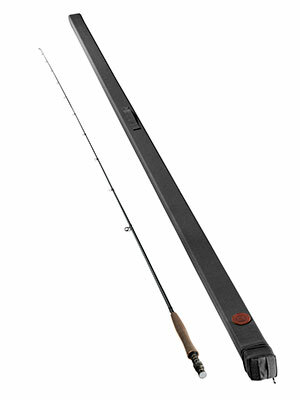 Scott lists both 2-and 4-piece options in a portion of its saltwater rod series. Every other rod maker I’ve examined recently only offers 4-pieces. More “travel rods” isn’t my priority. When fortunate times again include New Zealand and South American trips, I’ve tucked aside 4-piece, 5-to-7-wt. trout travelers. A 9-, 10- and 12-wt. stash awaits Baja, Guatemala and Great Barrier Reef rematches. In 2011 I divested a summer business which regularly encouraged well over 100 days of trout fishing. A sturdy tackle collection arose for the pleasurable 37-year task of rowing rafts, drift boats and skiffs around Wyoming and surrounding waters. Throughout that time I was repeatedly shocked by tackle poundings dished out by both friends and clients who treated my gear worse than their own. With a few exceptions, careful tackle care is dismissed by most. From bamboo beginnings, my transition to hollow fiberglass was facilitated by Wright & McGill and Shakespeare. After I began float trips in 1974 my working tackle was mostly Scientific Anglers and Fenwick 2-piece rods. Early fiberglass rods, much like bamboo, could be worn out from lots of casting. These softened rods became hard to cast. The original metal ferrule connections also interrupted actions. Eventually skillful rod makers created various sleeve and spigot ferrules that banished metal. Graphite and boron rod materials pretty much eliminated rod softening. During casting, fighting fish and freeing snags, less can go wrong with 2-piece rods. But since rod manufacturers and importers insist that their customers demand only travel rods, the 4-piece invasion continues as the overwhelming fly rod configuration available today. My on-the-water observations disclose that it demands extra effort and time to check and tighten all 3 ferrules on 4-piece rods. Most users, especially newer ones, ignore this requirement. Casting weighted nymphs/strike indicators and streamer rigs loosen ferrules sooner than presenting dry flies. Thus it became equally as important to spot a client’s loosening or twisting rod section as it was to recognize a trout take or a leader wind-knot-inducing cast. Preventing rod section cast-off was my goal. Despite suggesting ferrule inspections–it was disappointing to see how few multi-piece rod owners ever checked and/or re-snugged all their rod sections, especially after several hours of demanding casting. This behavior was repeated regardless of how much ferrule wax was applied earlier or how experienced the angler. I hated rowing or chasing disconnected rod sections that escaped into the river–especially in whitewater. Counting on a small fly to hook and save your rod tip is a bad bet. But even more important was eliminating those sickening rod-snapping sounds that follow when sudden pressure is applied to a loosened ferrule. Other ferrule inattention accidents don’t come with a snap but exhibit a rather disgusting, slow-motion rod collapse. Similar accidents may plague 2-piece rods but not as easily. To quiet my whining over a steady 4-piece for diet, I have been advised by Sage’s veteran rod designer that I should either use electrician tape to further firm my multi-piece rod ferrules or—when I’m becoming more adamant—add epoxy for a permanent connection. My workshop epoxy handiwork on lures and flies is dismal enough that I’ve avoided the latter solution. Lobbying for a return to selected series of 2-piece fly rod production, say 4, 5 and 6- wt. trout rods and 7 through 12-wt. saltwater versions is futile. Sage waved goodbye to such thoughts after the Z-Axis series vanished. I suspect, first, that emerging angler groups lack exceptional 2-piece stalwarts which they’ve learned to appreciate. Secondly, rod sales appear focused on hauling the newest purchases on soirees where portability is paramount. Trip planning ignites frenzied rod gear purchasing better than Christmas music. I’ve heard that smaller vehicles, especially in foreign markets, necessitate downsized rod cases. Moving in and out of float planes, helicopters, airboats and commercial flights gives 4-piece rods an advantage. The majority of my fishing isn’t destination travel. Rod performance, not portability, is paramount. Favorite 2-piece fly rods, rigged but broken down, are with me whenever shopping for another family or work vehicle. If this rod/reel combo can’t fit comfortably across the dashboard of a truck or mini-van, I shop elsewhere. Fully rigged 9 and 10-ft. rods, slightly arched, fit happily in my wife’s Subaru Outback, the tow vehicle for her guided river float trips. Arriving with cleaned lines, new leaders and rigged rods saves her valuable time on every outing where minutes count. Standard 8-foot pickup truck beds with carpet kits have been carrying my rigged 9- to 10-foot fly rods handily for over 20 years. Although the latest drift boat designs sport somewhat protective rod holders, my comfort level requires trout rods to ride in the truck. Backcountry skiffs usually include a safer fly rod transport system for short distances to the water. Winter/spring travel to warmer fishing opportunities in the Keys, Everglades and Louisiana marshes utilizes a mini van that safely totes 1-piece fly and conventional rods and accommodates 2-piecers in tubes. Using my preferred tackle has long dictated a travel conveyance which permits investigation of interesting barbecue, green chile, boudin, muffaletta, fried chicken, Basque and other yummy regional treats not constricted by TSA inspections and air travel headaches. My comfort level when pulling hard with a fly rod against large and energetic battlers improves noticeably when less ferrules are involved. Cranking off accurate presentations feels better under the same rod configurations. Fewer ferrules are one less item for me to worry about when tarpon, billfish or a barramundi are fighting for freedom. Ow-eee! I can hear disapproving wails rising from dozens of satisfied big game chasers defending their multi-piece travelers in the face of such brash criticism. Observe, I didn’t say big fish couldn’t be landed on proper 4-piece tackle. I’ve been successful with a variety of travel gear in the ocean. In Guatemala I was eager to present Pacific sailfish with the opportunity to flex my then latest RPLXi Sage. During the first hookup and ensuing acrobatics I babied the 12 wgt. As the trip evolved I happily noted that the 4-piece could apply adequate pressure without any bad results. But that handsome cobalt blue showpiece would struggle to match the lifting power of my favorite relic, a 2-piece RPL 1290 Sage. I’m convinced the newer rod wouldn’t have survived like the RPL did, from the late night Cabo hotel lobby ceiling fan I accidentally challenged. Obviously both my guide pal Jim and I are fond of absorbing the smooth grace administered on each cast with the simpler rods we’ve come to trust. They cast well, rebound from repeated struggles and provide us with abundant confidence. But then, maybe we’re just getting old.